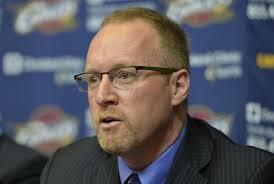 Cavs General Manager David Griffin spoke to the media Friday night and described the reasons for the firing of David Blatt. Griffin announced that Tyronn Lue will be taking over as head coach, not on an interim basis. Griffin spoke about a “lack of fit,” a lack of connection, and lack of spirit he has noticed among the team for roughly the last month. And based on the GM’s tone at the press conference, what he saw through 41 games this season, he did not feel the team would finish with any results better than “pretty good” if this change was not made.